With just a few days left for the 70th celebrations of India's independence on August 15, the country's capital's skyline, as usual during the period, is dotted with kites of all sizes, colours and fancies. People of all ages and religions fly them with a vengeance in an attempt to cut each other's kite lines, either by letting the cutting line loose at high speed or by pulling the line in a fast and repeated manner. 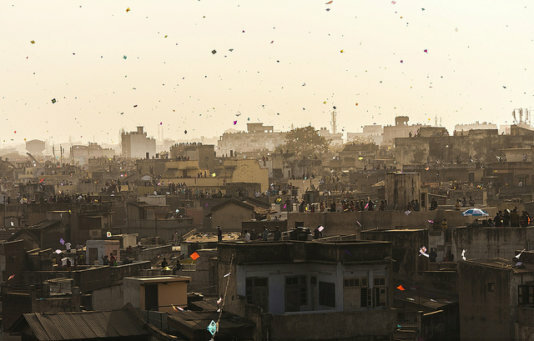 Unlike earlier days, when there were open space to fly these kites, now people find solace in flying them from roof tops. In order to cut more kites from the sky, people now use the cheap and the harmful Chinese manja (string used to fly a kite) which is sharp, glass-powder coated and nylon, capable of causing fatal injuries to humans and birds. Some casualties happen every year as the manja cuts the throat of a motorist or a passerby and also flyers falling from rooftops. The court has asked the state governmet to ban use of these strings, but according to the government, it won't be possible this year as the time is too short. It may be possible next year. At Lal Kuan Bazar in Old Delhi, the capital's biggest wholesale kite market, kites with messages of patriotism written on it, pictures of film stars and politicians, tricolours of flag, etc, are seen in plenty. A shop owner, Mohammad Altaf said, "Kids as young as five years come to buy kites. Those with impressions of Prime Minister Narendra Modi and the National Flag are in demand. Each person buys a minimum of 10 kites. Prices varies depending on the size and the decoration." Fifty-year-old Joshi, who came with his 10 year-old son, Rohan said, "I have been coming here to buy kites for years. My father used to accompany me. Now it is my turn to bring my son." Mohammad Salman of Kallu Bhai Patang Vale is happy that his handmade cotton manja will be in demand because of the ban on Chinese manja. His manja was the favourite for kite flyers till the Chinese ones came." But Manoj Gupta, a buyer complained, "Local manjas cost thrice than Chinese ones. Everyone cannot afford to buy it." However, shop-owners are worried about the low demand. Annu Qureshi of AB Kite Shop said: "By this time, our business should have been 100%, but it is down to 30%. Children have mobiles and computers to play. So, few turn up these days to buy kites." The tradition of kite-flying has sustained the business and families of many kite-makers for generations. But the winds of change are at work. 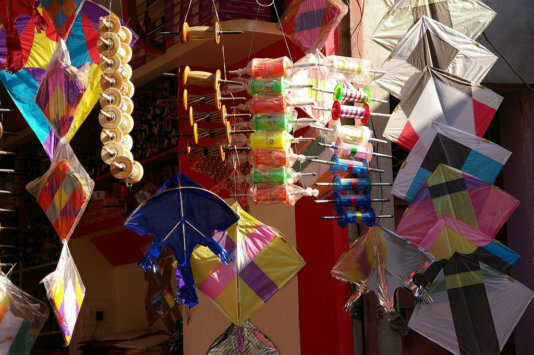 Kite-selling season starts on June 1 and ends with the Independence Day celebrations. Most of the sellers come from the neighbouring state of Rajasthan and make Delhi their home for three months. "We make kites at homes for nine months and sell them here in the remining three months," said Ali, a seller, whose family has been in the business for five generations. Eventhough his children are educated and may find some jobs, he wants that they should learn kite making. A local, Jay Gupta (70) said: "Kite flying is an whole body exercise, especially for arms and legs. It should be encourgaed at any cost." Umar Daraz (76) who makes fancy kites, spends about 3-4 hours on one kite. A veteran of five decades, he has been recognised and decorated by several governments and institutions. His children are also engaged in this business. His daughter, Sameena Parveen, had received an award from the Crafts Council of India when she was just 11 years old. Daraz has visited 12 countries including Russia, England and France to showcase his 'work of art'. He has participated in the Paris International Kite Festival, that is held every alternate year, in which 52 countries participate. He admitted that his profession is facing an Herculian task to survive. "The biggest enemy is middlemen who buy kites in bulk or tie them down with a contract, making them dependant on them." He said his art work cannot be learned in a factory-like atmosphere but only from years of honing the art. Kites are popular in Indian states of Bihar, Jharkhand, Gujarat, West Bengal, Rajasthan and Punjab. During the Indian spring festival of Makar Sankranti, near the middle of January, millions of people fly kites all over northern India. Kite flying in Hyderabad in the south starts a month before this, but kite flying/fighting is an important part of other celebrations. An international kite festival is held every year for three days in Vadodara, Surat and Ahmedabad. Kites were invented in China, where materials ideal for its making were readily available -- silk fabric for sail material; fine, high-tensile-strength silk for flying line; and resilient bamboo for a strong, lightweight framework. It has been claimed as the invention of the 5th century BC by Chinese philosophers Mozi (Mo Di) and Lu Ban (Gongshu Ban). By 549 AD paper kites were used as a message for a rescue mission. Ancient and medieval Chinese sources describe kites were used for measuring distances, testing the wind, lifting men, signaling, and communication for military operations. The earliest known Chinese kites were flat (not bowed) and often rectangular. Later, tailless kites incorporated a stabilizing bowline. Some were fitted with strings and whistles to make musical sounds while flying. From China, kites were introduced to Cambodia, India, Japan, Korea and the western world. 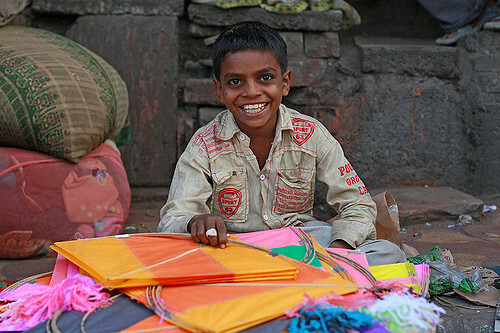 A kite seller at the Dili Diwarja Kite Market in India. Kite-flying during the Independet Day. The skies rustle with tissue paper and crack with polythene kites whipping against the wind. Here's the stock in trade of a kite shop in Nawalgarh.